Gaston®, the intrepid green-nosed alligator from the bayou, ventures far and wide to satisfy his wanderlust. Gaston®’s creator, James Rice, has written and illustrated eight books featuring the friendly swamp creature. Gaston®’s devoted fans have followed him since he led Santa's team of flying alligators through the bayou on Christmas Eve. Hardcover. This delightful coloring book tells the story of how Gaston®, the Green-Nosed Alligator, helped Santa Claus deliver his gifts one Christmas and how St. Nick came to live in Louisiana. Coloring Book. Gaston® the Green-Nosed Alligator has returned from the swamp and is taking adventurous readers on a tour of Mardi Gras. Experience the real events of Carnival with him through these beautiful illustrations. In Cajun country, he joins a courir du Mardi Gras group, enjoys spicy gumbo, and dances in a fais do-do until dawn. Gaston® the green-nosed alligator has returned from the swamp and is taking adventurous readers on a tour of Mardi Gras. The things he sees on his journey are the real events that take place during Carnival! In Cajun country, Gaston® joins a Courir du Mardi Gras group, enjoys spicy gumbo, and dances in a fais do-do until dawn. Come join Gaston® in his Mardi Gras discovery! Coloring Book. This miniature book of Gaston® Goes to Mardi Gras to hang on your tree tells the story of how Gaston® the green-nosed alligator has returned from the swamp and is taking adventurous readers on a tour of Mardi Gras. The things he sees on his journey are the real events that take place during Carnival! In Cajun country, Gaston® joins a Courir du Mardi Gras group, enjoys spicy gumbo, and dances in a fais do-do until dawn. Ornament. This is the first biography of Kansas’s only major Civil War-era general. Despite his absence from most Civil War histories, Union general James Gilpatrick Blunt was an immensely successful leader. Not only did he defeat Confederate troops at Fort Wayne, Prairie Grove, and Cane Hill, but he was instrumental in helping John Brown assist escaped slaves to Canada. This 35 x 26-inch full-color poster serves as a quick reference and study guide for the classroom or for anyone with an interest in Confederate history. 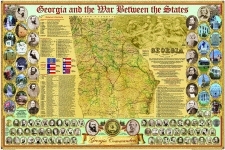 In addition to its centrally placed map of Confederate Georgia, it includes photos of the state’s two lieutenant generals, eight major generals, nine confederate civil officers, and sixty brigadier generals. Also pictured are twenty-three important Civil War sites that can be visited today, such as Stone Mountain and Andersonville Prison. In this counting book with a spooky twist, ten ghouls sneak out of the hills and into town for some thrills and fun. Children can follow along as the mischievous creatures haunt one by one until the surprise ending. The story explores such concepts as facing fears and overcoming challenges while the colorful and abstract illustrations inspire creativity. The clever rhymes offer a playful approach to learning language skills. Beginning with her revelation that Leila Marie Cody flew in a kite years before the Wright brothers created their airplane, Charlene continues with a “who’s who” of influential female figures. Recounting history from Anne Morrow Lindbergh, who was the first American woman to earn her glider pilot’s license, to Dr. Mae Jemison, the first African-American woman astronaut, Charlene confirms that girls can be anything they want to be—and, in fact, they can fly! Hardcover. The Fourth of July celebration was once filled with patriotic festivities, where neighborhoods trimmed their tree tops with flags and bunting and drew together for united merrymaking. Although this day is still highly recognized, nothing re-creates the true spirit of this commemoration like taking a nostalgic look at Independence Days of yesteryear. Diane C. Arkins has compiled a colorful anthology of inspiring old-time poems, evocative prose, decorating and party ideas, games, and festive menus spanning the late nineteenth and early twentieth centuries. With such a vast assortment of material, this book gives a splendid remembrance of the revelry of the past. With a cast of characters including Jeb Stuart, Nathan Bedford Forrest, and Robert E. Lee, this informative and well-received volume details the Confederate cavalry’s intrepid exploits during the Civil War. Among many action-packed tales are the stories of Forrest’s capture of Murfreesboro, Tennessee, Stuart’s long ride and late arrival at Gettysburg, and Wade Hampton’s daring raid to steal the Union army’s herd of beef. Paperback. Featuring forty-one vibrant black and white photographs and illustrations, this book includes details of Gordon Parks’ life and his work. Included are his photographs of the poor, stylish Parisian models, and the Civil Rights movement. The Fifty-ninth Alabama Volunteer Regiment, led by the New York-born Brig. Gen. Archibald Gracie, Jr., saw heavy action at Beans Station, Tennessee, and in Virginia at the battles of Richmond and Petersburg. It was one of the few Confederate regiments that lost more men to the musket than to disease during the Civil War. Quoting from authentic letters, the author describes the regiment’s odyssey from its origins as Hilliard’s Alabama Legion to its final days as part of the Army of Northern Virginia. Complete muster rolls are included. Hardcover. Tales of great giants, clever warriors, jealous queens, and mystical creatures abound in this richly illustrated volume of six traditional Irish legends. The book includes stories about a king with donkey’s ears, a moral lesson about riches and possessions involving a brown bull, a tale explaining how the coast of Antrim was formed by a giant, and other tales about treachery, bravery, and honor. When European settlers reintroduced the horse to the Western landscape, the Plains Indians soon adopted this wondrous creature. Horses were an important part of their nomadic existence and inspired many Native American myths. The greatest of these was Sunka Wakan, the blue-eyed spotted stallion who possessed great powers. Linda Little Wolf presents the legend of Sunka Wakan, the Great Spirit Horse, as an exciting tale of life on the Great Plains, retold especially for young readers. Paperback. When Saint Valentine was a priest during the third century in Rome, Emperor Claudius II outlawed marriage. Despite the emperor’s decree, Saint Valentine continued to perform marriages until Claudius finally put him to death. Today, Valentine’s Day celebrates Saint Valentine’s sacrifice and love’s triumph with delicate valentines, bright flowers, and tasty candies. Hardcover.